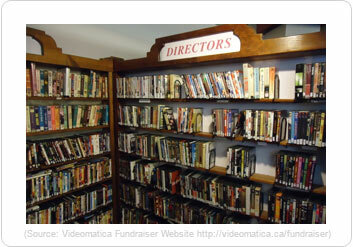 Vancouver film enthusiasts were uniformly saddened by the closure of the city’s foremost video rental institution, Videomatica. UBC is delighted to welcome the collection (which contains around 30,000 films) to the university’s library, and to help assist in the preservation of films and film education in Vancouver. 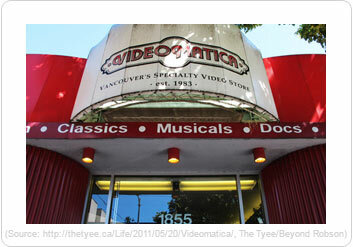 Originally founded in 1983 by UBC film grads Graham Peat and Brian Bosworth, Videomatica grew to become one of Vancouver’s most beloved and well-known independent video rental institutions. The collection of films gained a reputation as having an exceptionally broad collection of hard-to-find obscure titles ranging from foreign films to cult films and silent classics. (Source: The Tyee/Beyond Robson) The store was forced to close in the spring of last year due to the rise of illegal downloading and alternative online rental methods. After much deliberation over the future of the collection, it was able to find a home at UBC. Thanks to the kind support of local philanthropist Yosef Wosk, Peat and Bosworth found a place for their extensive and valuable film collection at UBC and SFU. The Videomatica collection is unparalleled in its selection, featuring titles that are as diverse as they are extensive. Obscure and difficult to find Canadian films, foreign exports from across the globe and many selections from the Vancouver International Film Festival all now sit together at UBC. It is no wonder that Videomatica was often touted as having the best selection of film titles in the country. (Source: Videomatica Fundraiser Website) Film Studies at UBC, along with the Visual Resources Centre, is excited to be providing a home for this beloved treasure trove of films. Preserving the collection is essential in keeping an indelible part of Vancouver’s film history alive. Archiving the collection at UBC will help to continue Videomatica’s tradition of educating the city’s film loving community, along withproviding an invaluable resource for research. We hope that the collection will continue to inspire an interest in film well into the future. A blog set up by film director Nimisha Mukerji (65 Red Roses) as a tribute to Videomatica. The creators asked fans of Videomatica to write reviews of their favorite rentals, ones that could not be easily obtained by other means (ie Netflix or Pirate Bay). One film review was posted on the blog every day from June 1st, 2011 until the store’s official closing. Empty Shelves , directed by longtime Videomatica regular Laurent Goldstein, is a short documentary about the impact that Videomatica’s closure had on the Vancouver film community.